The Clinton’s have two weddings coming up……. 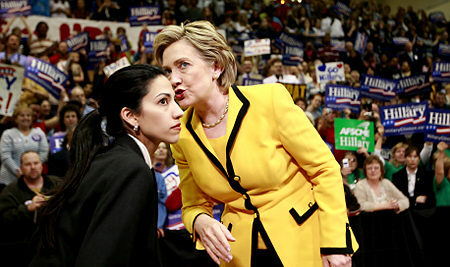 Their daughter Chelsea Clinton, and Huma Abedin, Hillary’s long time ‘Body Person’ ……. Secretary of State Hillary Clinton is entering a wedding season of her own. In addition to daughter Chelsea’s wedding, she has her longtime “body person” Huma Abedin’s nuptials, in which the groom is Rep. Anthony Weiner. So Clinton is throwing a party in honor of Weiner and Abedin at her Kalorama home, according to several people close to Hillaryland. The party will apparently occur before the wedding, which will be held on Long Island at the beginning of July. Chelsea Clinton’s own wedding, about whose preps the secretary of state has spoken warmly, is slated for July 31. The Clinton's have two weddings coming up……. Wait until they hold the wedding…..Then she can cry tears of joy…..
She could use it…it’s been a rough past year…..